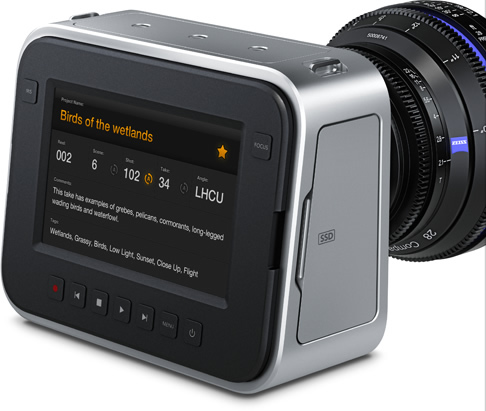 This one claims to be able to carry a RED camera with a small-ish lens for 7 minutes on a single charge. 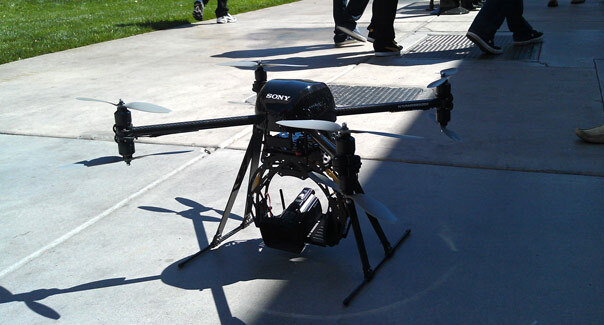 You couldn’t walk very far at NAB this year without tripping over one of these things. I got to watch a few “test flights” of a few different models by a few different manufacturers (the one pictured is from a Dutch company called Aerialtronics and costs around $10k, “ready to fly,” not including camera/lens, and they claimed it can fly as high as a mile). – They are noisy as heck, so make sure you have an ADR budget. – The demos were all done when there was virtually no wind, so the shots looked smooth like buttah. Am skeptical about the potential reality of shooting in windy conditions. – The demos were all done by operators who clearly had lots of experience flying these things. Training is clearly required to get good results (and not send your precious camera/lens crashing down from 10,000 feet). – They all look like FUN TO FLY. Considering the costs of renting a real helicopter, this could be an interesting trend. In the right conditions, you could also do jib and crane type effects. Wish I had $10k kicking around right now. Before you output your edit/piece/whatever, lay in some viz code (aka BITC — Burnt In Time Code). The timecode on your client’s comments should match the timecode on your timeline. Don’t rely on what is displayed in the player your client will be using to screen the review cut — that is at best imprecise, and at worst inaccurate. 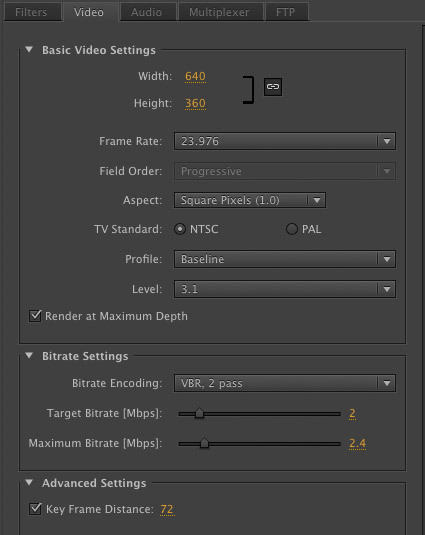 Create a transparent video clip, lay it in on a new layer on top of your timeline, stretch it to fit the duration of your edit, apply the Timecode effect to it, and modify the Timecode effect so it’s framerate matches your sequence framerate. Go to File > Export > Media (or whatever the command is for your editing tool), then give the file a name. Use a solid versioning system, to track changes. I like to use something similar to the way software releases are versioned, i.e. “1-0” is the final cut, and anything before that is “0-x”. Use dashes instead of dots, otherwise it will mess up your file naming. Make sure the viz code matches the sequence timecode. Once you’ve set the file name, set your encoder’s “Format” setting to “H.264” and then set the video and audio settings as seen in the following screengrabs. I think 2 Megabits per Second is a good bitrate for reviews. I also think that forcing a keyframe every 3 seconds results in better quality. 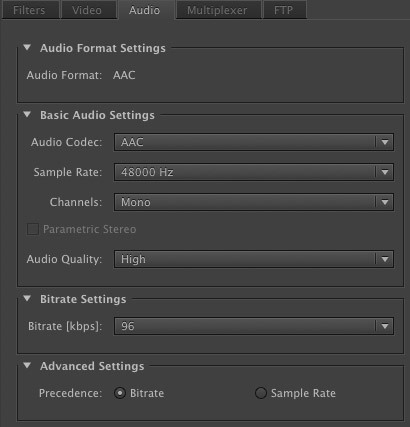 Video settings shown in CS6. Outputting at half-frame-size of 720p. The only caveat is that the audio settings assume you’re not creating something where monitoring of final-quality audio is essential to the reviewer. In most rough cut scenarios it isn’t. Once you have your output, deliver it via a file sharing service such as Send Now or You Send It. Don’t e-mail review videos — not only are they too big, they tend to get caught in spam catchers. Send Now, You Send It, and similar services will automatically notify your client via e-mail once the file has been uploaded and is ready for them to download. A single click in the e-mail opens a new browser window with a link to directly download the file. If what you’re sending is of a sensitive nature, make sure you read the Terms of Service of whatever service you use to make sure you’re comfortable with what can and cannot be done with what you are uploading by the company who owns said service. Stereo usually isn't necessary for review cuts. 00:23:11 – Can you find alternate b-roll here? 01:01:16 – This is a strong statement, can we move it to the front of the piece? This is a simple and no-cost workflow that anyone can use. There are more elegant solutions out there. Are there any you use and like? “DSLR Killer” Too Good to Be True? I went to NAB last week, mainly for biz dev meetings for my company, but managed to get a look at some of the new toys as well. My team has shot quite a few projects over the past few months with Canon DLSR cameras, such as the 5D. On the plus side, you can use a wide range of Canon lenses to get rich, cinematographic looks very inexpensively, and for the $ the 1080p image quality is quite decent. On the minus side, the 5D isn’t really designed for video production at all, from both a form-factor and feature perspective. I don’t expect a whole lot of innovation from Canon on the DSLR side of things, as they would like us pros to move up to their much more expensive, and higher quality, C series cameras (which I also had a look at during NAB — they look rather impressive). 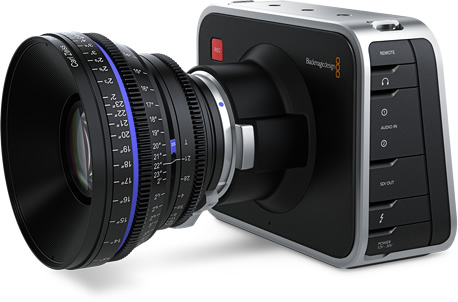 Blackmagic Design has put out some stellar products over the years, but as a friend pointed out “they’re not known for putting out quality 1.0 releases.” That caveat having been said, I can honestly say I’m pretty stoked about the potential for the Blackmagic Cinema Camera, which they debuted last week at a massive NAB booth, the footprint of which used to belong to Apple before they quit the farm and became the iPhone company. If this camera does what it’s advertised to do, it will solve every major complaint I have about DSLRs in video production. Better image quality, form factor, connections to external devices such as a client monitor, SSD storage — and my company can use the wide range of Canon lenses we’ve purchased (several more expensive than the 5D itself BTW). On the surface, this looks like a no-brainer. I expect to have one in my hands in July to try for myself. Anyone have any thoughts on what might prevent replacing a 5D with one of these?